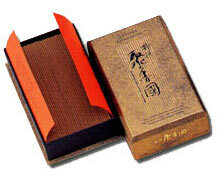 Excellent Syukohkoku contains the highest grade and content of fine Aloeswood of all the main lines of Baieido Incense. Because of the fragrant woods and traditional ingredients it is recommended for experienced practitioners and for special occasions. Excellent Syukohkoku contains the highest grade and content of refined and sophisticated Aloeswood of all the main lines of Baieido Incense. Because of the fragrant woods and traditional ingredients it is recommended for experienced practitioners and for special occasions.